CHP was founded by Mustafa Kemal Atatürk on 9 September 1923. 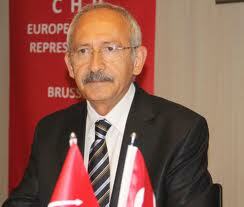 Under the direction of Mustafa Kemal Atatürk, following the national liberation war, CHP was the leading political movement in the creation of the Republic. During the first period of establishment of the Turkish Republic, CHP pioneered economic development, industrialization, gender equality and right of vote for women, reform of the Turkish language with the World’s most phonetical alphabet, promotion of the civic society as well as a foreign policy determined by the promotion of the international peace. Following the World War II, CHP led the democratization process and oversaw the transition from a single-party regime to a multi-party system. Mustafa Kemal, founder of the Turkish Republic, was born in Saloniki on the l9th May 1881 of humble background. His father started out as a customs officer, later becoming a timber merchant. Following his sudden death he left behind a family having to fend for itself. As a child Mustafa finished primary school in Saloniki, going on to secondary education at Rucholigè School. Despite opposition from his uncle, who had taken on the responsibility of looking after the widow and her two children following the death of his brother, Mustafa entered military school, completing his military training in Istanbul. He succeeded in entering the Military School (Harbiye) where he completed his studies with flying colours, after which he was accepted into the School of the General Staff. In December 1905 he was commissioned as General Staff Captain. Throughout his studies Mustafa Kemal consistently proved himself a conscientious, aspiring and diligent student who liked to interest himself with particularly difficult and complex problems. Whilst at military school in Saloniki, he distinguished himself in mathematics and literature. At the same time, and due mainly to his own efforts he started to learn French, in which he made considerable progress. Yet another trait of character which began to show through in his early youth was Mustafa’s ability to show initiative and exceptionally his ability to give orders, whilst at the same time maintaining a sense of fraternity with his comrades. In the School of the General Staff he pondered long and hard over the hardship caused by the dictatorial rule of Abdullamid, who from within his famous Yildiz Palace spread fear throughout the whole country. Just like his comrades at the school, Mustafa harboured the same feelings of disgust and rebelliousness towards the political regime of the Sultan. For this reason he did not hesitate for one moment about taking part in the secret underground activities going on at the General Staff School, directed towards the overthrow of the Yildiz Regime. Between the years 1905 and 1918 Mustafa Kemal was deservedly awarded high ranking posts in the military chain of command. He became Chief of General Staff of the army that was sent out from Saloniki to put down the uprising of the l3th April 1909, a movement designed to return the country to Hamadic Absolutism and which had started with the non recognition of the Constitution that had been declared on the 23rd July 1908. Mustafa proved to have special qualities in the organisation and management of this army of oppression, known as the Army of the Movement. In 1910 he lead the Turkish Forces during military manoeuvres in the Province of Picardy in France. In 1911 he fought in Tripoli against the Italians, and in 1914 whilst serving as Military Attaché in Sofia, he successfully drew the governments attention to the catastrophic results connected with Turkey’s entry into the war with Germany and its allies. During World War I Mustafa fought against the Allied Forces at the Dardanelles, the Russians on the Mus Front, in the east and against the British in Syria and Iraq. During the war he visited Germany as Military Adviser, together with hereditary Prince Vahdettin. At the time of signing the Armistice Declaration on the 30th October 1918 Mustafa Kemal remained at the head of his troops, a command given to him by the German General Liman von Sanders. In the years between 1918 and 1923 Mustafa Kemal was at the forefront of the Turkish War of Independence and involved with the eradication of the antiquated institutions of the Osmanic Empire and in laying the foundations of the new Turkish State. He approached the National Congresses of Erzurum and Sivas to organise and lift the morale of the people in its determined opposition to the Forces of the Entente who were occupying Anatolia. By the end of these conventions he had managed to convey the message that the idea and the ideals of outdated imperialism ought be dropped so that people within the national boundaries could make decisions in accordance with the principles and general guidelines of an effective national policy. After the occupation of Istanbul by the Forces of the Entente he laid the foundations for the new Turkish State when in 1920 he united the Great National Assembly in Ankara. With the government of the Great National Assembly, of which he was President, Mustafa Kemal fought the Forces of the Entente and the Sultan’s army which had remained there in collaboration with the occupying forces. Finally, on the 9th September 1922 he succeeded in driving the Allied Forces back to Izmir, along with the other forces which had managed to penetrate the heartland of Anatolia. By this action he saved the country from invasion by foreign forces. On the 24th July 1923 the States of the Entente were obliged to recognise the territorial integrity of Turkey in the Treaty of Lausanne. So it came to pass that in quite a spectacular fashion Mustafa Kemal had achieved the first step in his reform programme, the creation of a sovereign and independent state. From 1923 to 1938 Mustafa Kemal’s main work lay in leading the Turkish State and its people along the path in the direction of the outside civilised world. The ideal of an independent fatherland within national boundaries had already been achieved before 1922 and therefore the idea of a truly modern state, whose role relied on the sovereignty of its people, could be developed by the most rational means available during this period. Following their separation, Sultanat was abolished in 1922, whilst Khalifat continued to exist. At the Proclamation of the Republic on the 29th October 1923 this emporia institution proved to be superfluous and it was likewise abolished. This also resulted in the disbandment of other theocratic institutions on which Khalifat was founded. By the same token all similar types of organisations and theological institutions which had regulated the role of the individual and society in general were closed. Finally by amendment to the constitution, the principle of (secularism) – that all so important factor in community life – was introduced as an anchor of the new democratic and republican constitution. As a result of this new direction, all laws, rules and regulations, institutions and methods of a theological nature that had been an influence on the dealings of state and social order were abolished and various political and social reforms introduced along Western lines, suitably adapted to meet national security and interests. In brief are mentioned here some of the important reforms introduced under Kemal: the international calendar and time were adopted (1923). in place of the traditional head garment, the fez, introduced under the rule of Sultan Nahmond II, the West’s style of hat became obligatory (1925). Swiss civil law was introduced adapted to the conditions and needs of the country (1926). The Civil Code, Penal Statute Book and the Trade Law Book were introduced. The legal position of women and their place in society in the new republic was greatly improved (for example the active and passive voting right at national and local elections). Only due to the efforts of this great man, which he maintained with exceptional strength of character and persistence, helped along by his ability to work methodically, was it possible to introduce all these reforms. Thanks to his great organising talent he led the country to considerable prosperity and down the path of civilisation and peace. Kemal laid the foundations of a truly modern Turkey, a democratic, republican and independent state based on national sovereignty. Although these ideas originated from him and were paramount in the foundation of the new state they remain today an integral part of the republican government of our country. The foundation stone, or perhaps even the very soul of Ataturk’s spiritual and intellectual philosophy, was the thought of universal peace and although the biggest part of his life was taken up by war, he always considered it a crime. According to Ataturk war can only be just or justified if it is fought out of sheer necessity or for reasons of national defence, or pursued by a people awaiting their sovereignty, their very lives depending on it. To live freely and be independent is both a holy right of the individual and of the nation, this right being stronger than power itself. Only by his own personal conviction was he able to frame the all inspiring guiding principle of the Republic of Turkey – “Peace in the country, peace in the world.” This principle points with absolute clarity and determination the way forward for the country’s future home and foreign policy. From the ideas that Ataturk held the idea of civilisation should not be overlooked as it is no less important. In the course of his short life he never ceased repeating the fact that views which are based broadly on regional perspective’s of the West or East, or on religious perspective’s, be they Islam or Christian, often weaken the thoughts of civilisation, as they fail to manifest the small or special characteristics. Civilisation is something whole and exclusively human, a universal property. It therefore goes without saying, that the share every nation in the world has in civilisation is considerable. In the view of this inspired reformer, mankind has a duty to constantly adapt himself to the needs that reason demand. His guide in life should be science. Following on from these basic beliefs Kemal took it upon himself to provide everyone in the country with an education, at the heart of which lay the creation of citizens having special qualities, or in other words, the sense and direction of the education he wanted to give to the people was very clear in that the Republic needed to produce generations of people whose thinking, beliefs and education were totally free. Not to mention his view of egoism being wholly incompatible with the idea of civilisation “Egoism, whether individual or national is to be condemned”. He reminds us that all nations of the world form one large family and that whenever a disaster strikes one of its members, then it is felt by the rest – like the pain felt from a needle penetrating a part of the body and felt throughout the whole body. With the intention of spreading his ideas within the educational sector, and supported by national campaigns, Kemal continued to put forward his form of humanitarian education, with the aim of producing an enlightened people free from prejudice and intolerance. The desired objective being simply to develop citizens of the world, free from desires such as envy, revenge and conspiracy. In a world inhabited by such communities it might be possible to find an instrument, an organisation that stands above individual states, or in other words: “a body of united nations”, whose main purpose is to maintain peace. 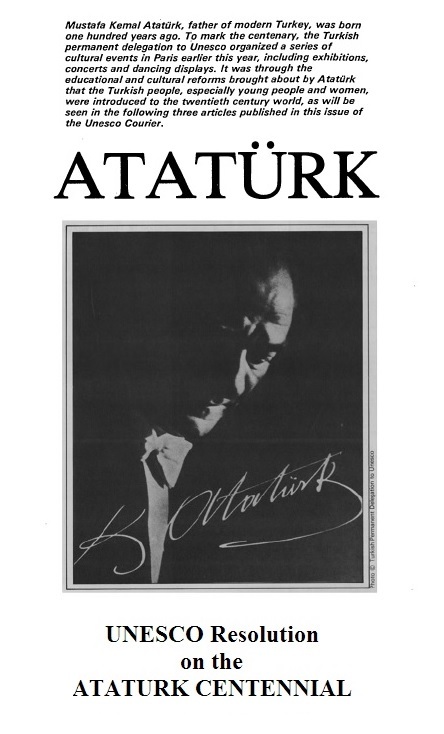 In this respect Ataturk’s ideas date from the time between the World Wars, particularly that before World War II but are nevertheless topical because in a way Ataturk had predicted the concept of the United Nations. Furthermore, it was at a time when the ideological battle had reached its climax and for this reason such views were of a prophetic nature. For a man who had set himself the task of building up a country based on the most convincing human achievements and under the banner of reason. On the Cal Plain, Ataturk expressed his opinion about the sultans and caliphs saying: “My friends, expelling from Turkey those who sat in their palaces relying on nothing other than (Turkishness), and who marched with our enemies against Anatolia and against (Turkishness) has proved an even greater mission than that of removing the enemy from our country. (!) Absolute control of the Turkish Nation, our country and ancestral heritage, could only be achieved following the closure of these superfluous and harmful offices. Ataturk in expressing his opinion about technology and science stated; “Our country not only needs cultural development and wealth but also science, technology, civilisation, freedom of thought and a free ideology. Our honour, independence and existence must support us in the basic and important work necessary to achieve the interests of the nation. Later, a Turkish child communicated Ataturk’s notes to the guests. “A nation is able to carry out reforms in many ways and to succeed in them. The reformation of music however reflects the exceptional development of a nation.